1. Take your child to orchestral concerts. Many symphonies sponsor concerts specifically for children in an informal setting. These children’s concerts serve to introduce them to composers, instruments, and the “classics” through narration, puppetry, active participation, as well as, instrument handling. 2. Sing! Sing! Sing! Sing as a means of making less pleasurable tasks, more pleasurable! 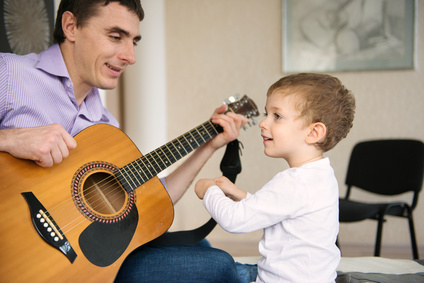 As your child picks up his/her toys, wakes up, goes to sleep, etc., sing to accompany the task. Remember..., children do not care whether or not you are a singing star! 3. Use recorded music to set the tone at home. After your child has had a long, tiring day, use this time to introduce him/her to the classics by playing soothing music, as he/she is encouraged to relax. Lively music may be used to awaken or encourage more active behaviors. 4. Use pre-recorded, children’s, educational music at home and during travel times. You would be surprised to see the many facts your child could learn just by listening! 5. Teach your child to spell his/her name by using a familiar or the “na, na, na, na, na” teasing tune. Other pertinent information such as phone number, address, or safety skills may also be taught in this manner. 6. Hang chimes and other sound-making devices both in- and outside the home. This will encourage your child to explore and discover the world through sounds. 7. Read your child’s favorite story and add special-effects using household items. Example: hitting 2 spoons together to represent the clip clop of horse’s hooves; dropping a book on the floor to represent closing the door; etc. REMEMBER: Be creative! !